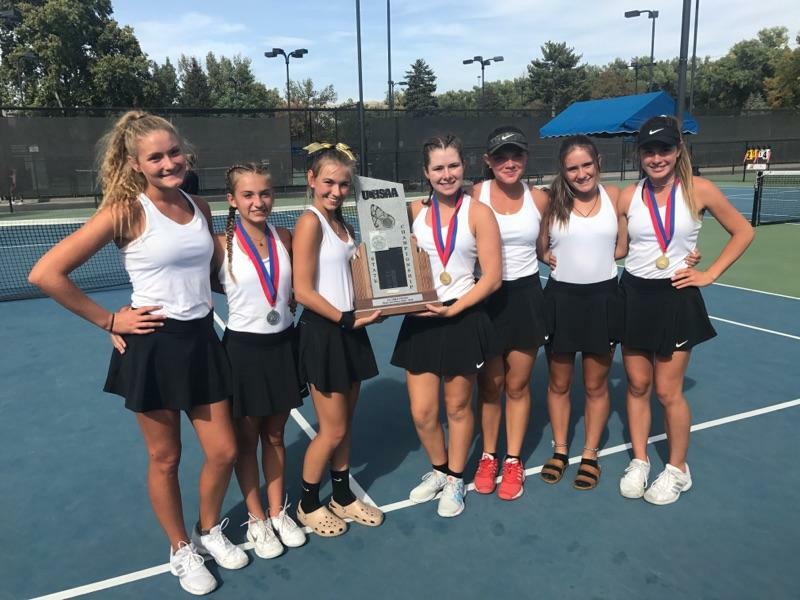 ST. GEORGE — By the closest of possible margins, the Desert Hills High School girls tennis team fell short of the 4A state title Saturday, finishing in a second-place tie with Park City High School, the reigning four-time champions. Both Desert Hills and Park City finished with 16 team points in the two-day tournament at Salt Lake City’s Liberty Park, while Cache County’s Ridgeline High School won the state 4A title with 17 points. The Lady Thunder had gone undefeated on the tournament’s first day Thursday, advancing its players to the semifinals in all five brackets and taking an early overall lead. 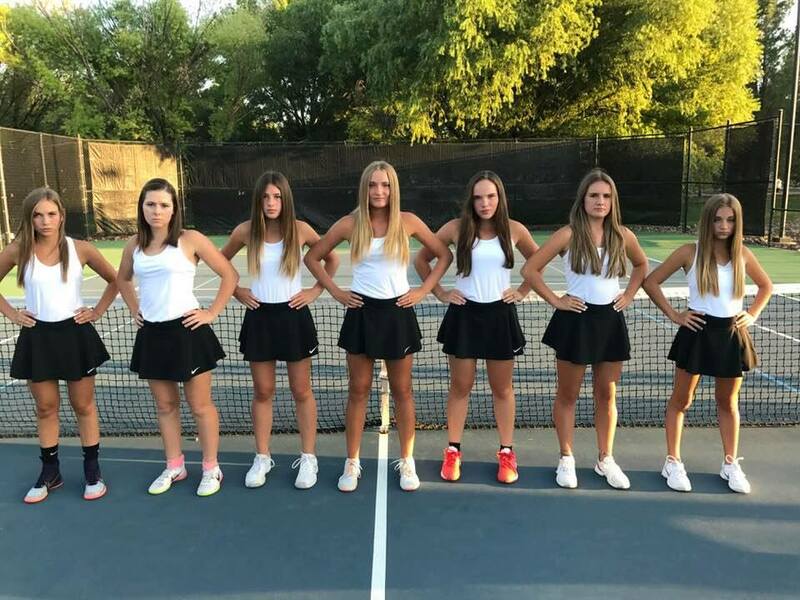 In particular, Smith said Faith Hess had a high temperature Friday night as the Thunder’s top doubles team faced a competitive Logan team in their semifinal match. Hess, along with partner Cassie Kohler, a newcomer to the state tournament, came out flat and with predictable butterflies, their coach said. 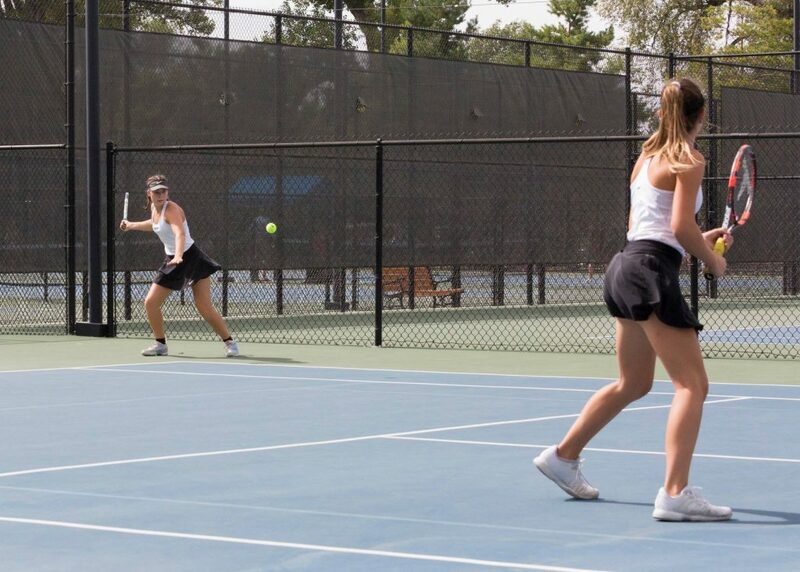 The pair lost their semifinal match in two close sets to the eventual first doubles champions, Heather Roskelley and Annie Spach of Logan High School, 6-2, 6-4. Desert Hills’ semifinal loss in No. 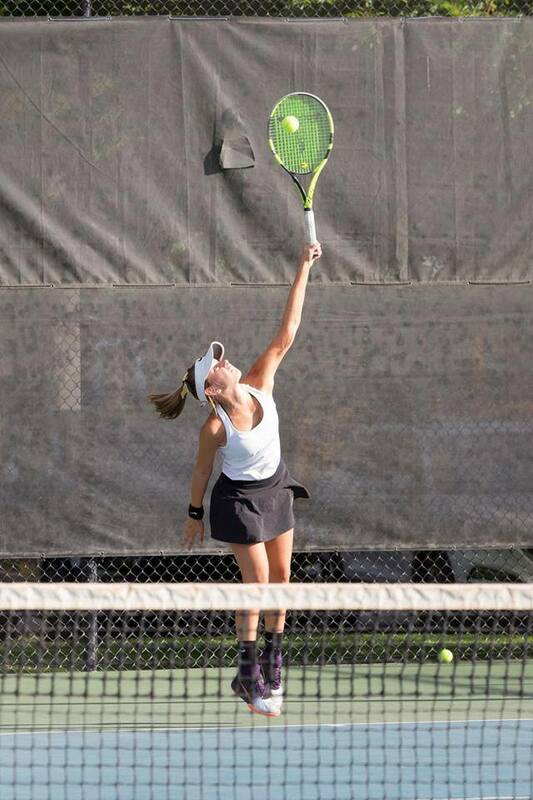 1 doubles was offset by superb play by sophomore Mackenzie Telford at the number two singles spot. 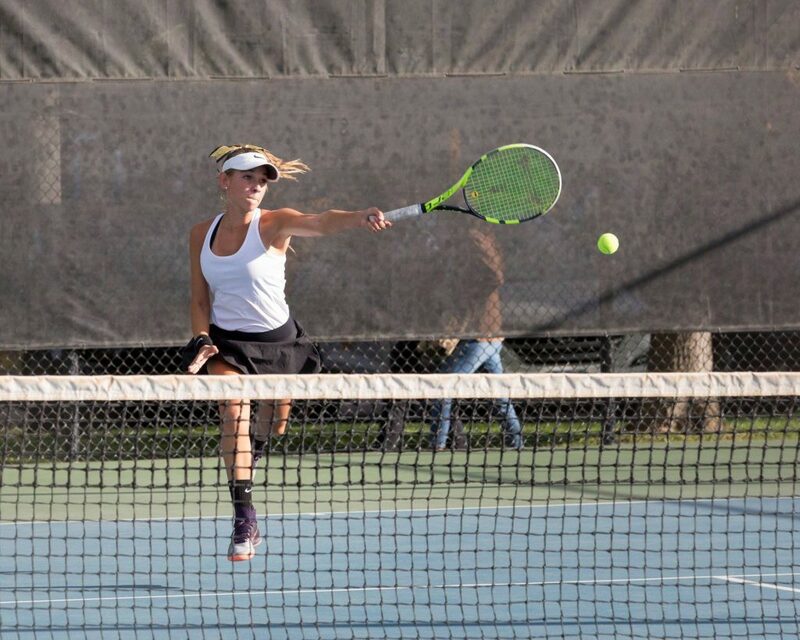 Telford dispatched Ridgeline High School’s Lucy Lyons 6-1, 6-2, in her semifinal. “Kenzie played some of her best tennis against Lyons,” Smith said of his diminutive singles player, who weighs about 85 pounds. In the No. 2 singles final, however, Telford fell to three-time state champion Gabby Rockwood of Park City, 6-2, 6-1. 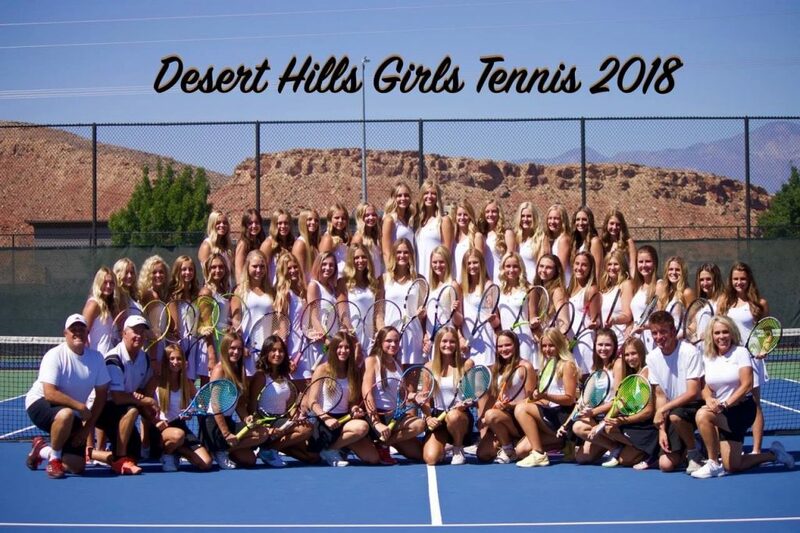 At that point, Smith said, Desert Hills still had three matches to go, but things were not looking good for the Lady Thunder in their quest to dethrone Park City. Up next was the Thunder’s No. 1 singles player, Mo Behymer, who went up against Park City senior Livi Rockwood, Gabby Rockwood’s twin sister, in the semifinals. Livi Rockwood took out Behymer in straight sets, 6-0, 6-0. “I’m so proud of Mo for her entire season, but especially fighting though being sick this whole week,” Smith said of his top player. In the other semifinal match in No. 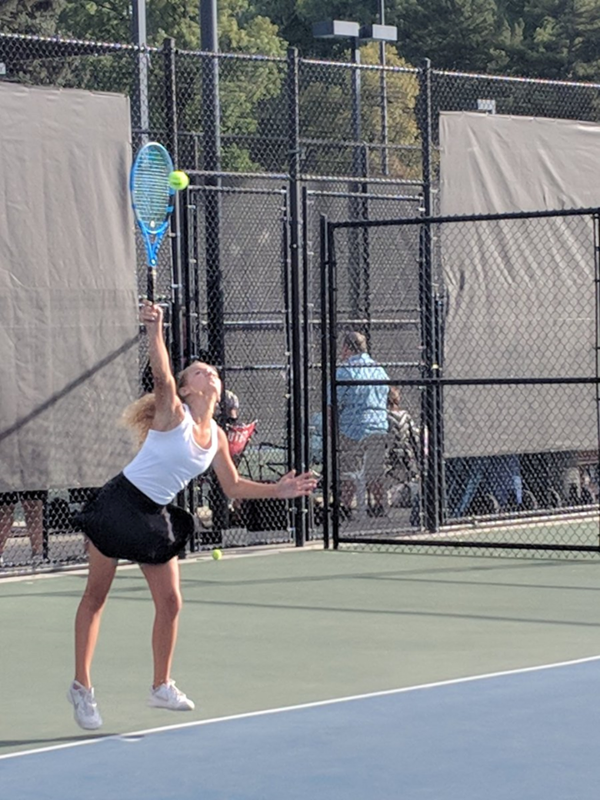 1 singles, Pine View High School freshman Taylor Parsley went up against junior Naya Tillitt of Ridgeline, with Tillitt advancing to the final with a 6-0, 6-0 sweep. 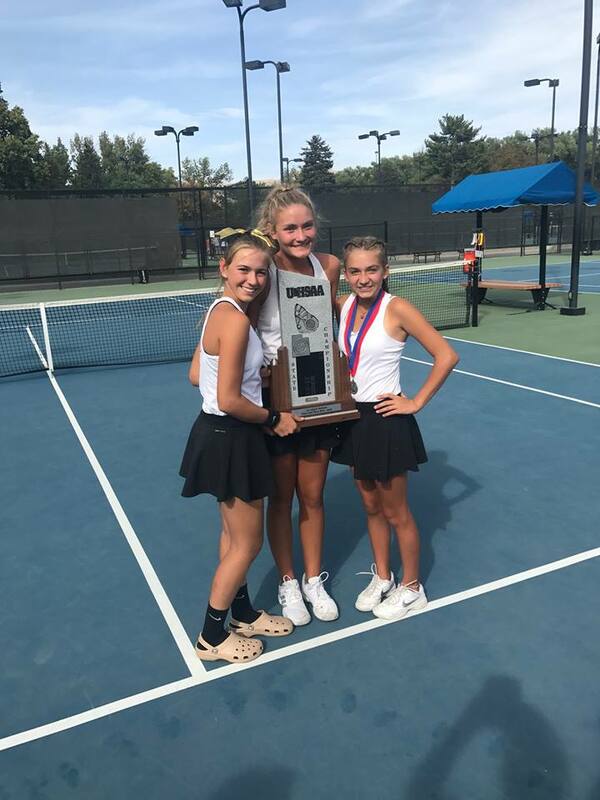 In the ensuing finals match that ended up helping clinch the team championship for Ridgeline, Tillitt then defeated Livi Rockwood in straight sets, 6-1, 6-1. In the semifinals of the No. 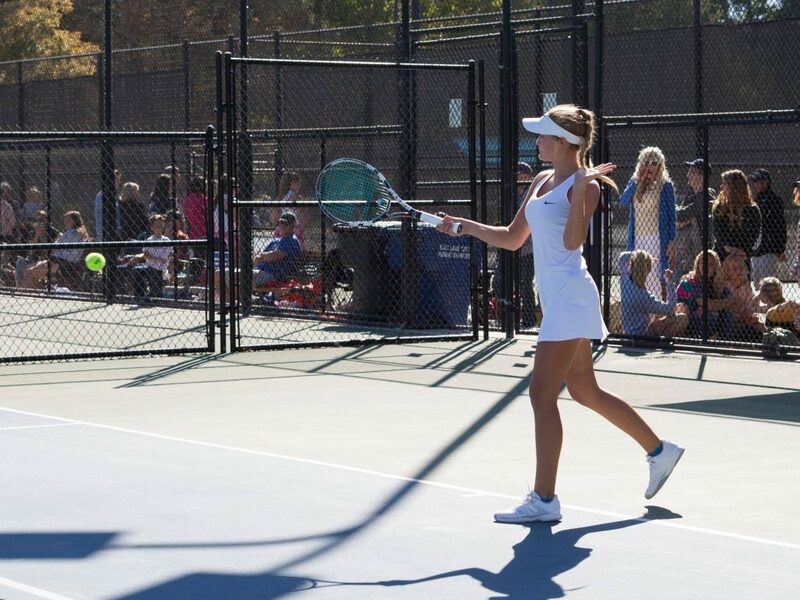 3 singles bracket, Desert Hills sophomore Tia Turley found herself in a dogfight against Park City’s Brooklyn Thompson. Turley fell behind early, losing the first set 6-3, but clawed her back to win the second set, 6-4. Thompson then stormed ahead in the final set, knocking off Turley, 6-2. 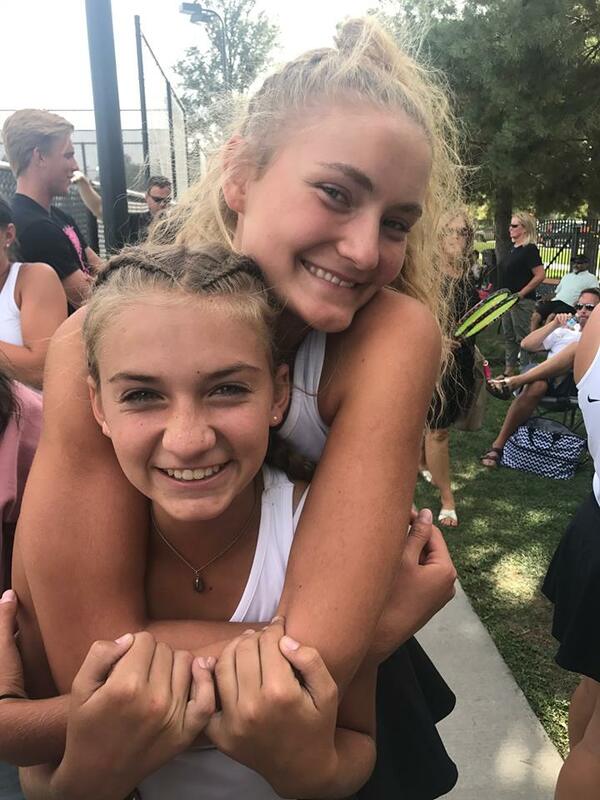 The Thunder’s final match of the day Saturday featured Desert Hills’ second doubles team, with veteran star Lyndsi Graf, the only senior on Desert Hills’ state contingent, teaming up with freshman Averee Beck. Earlier Saturday, the duo struggled to make it past Orem High School’s Gabby Bailey and Abby Dunn in their semifinal showdown. After losing the first set 3-6 and going down a break of serve in the second set, 3-4, the Thunder duo suddenly came alive and pulled out the second set, 7-5. Graf and Beck then rode that momentum to a 6-0 third-set victory. 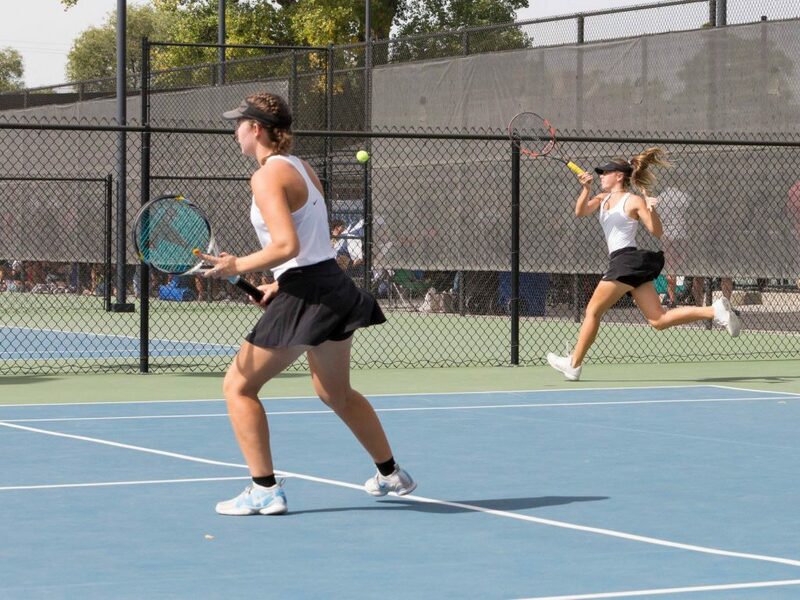 The win over Orem advanced Graf and Beck to the finals, where they faced the talented Salem Hills High School duo of Meg Weeks and Leah DeHart. 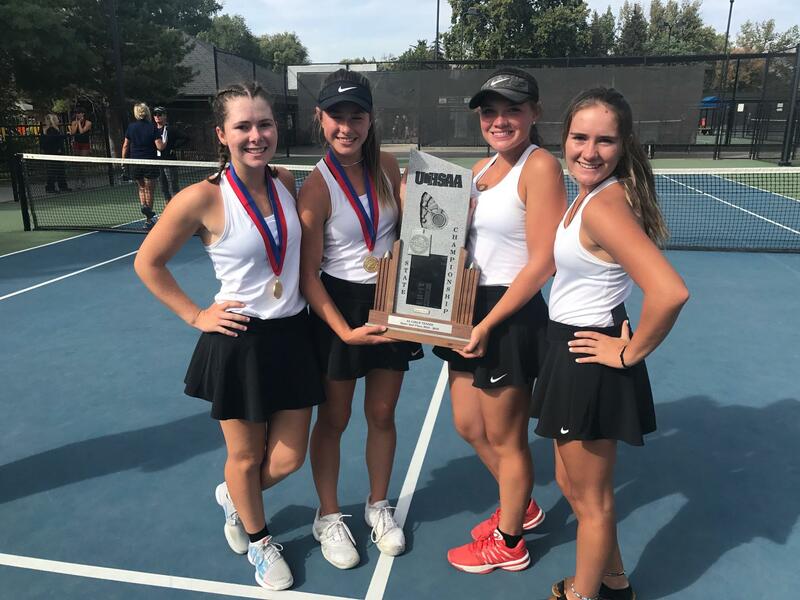 At that point, as all the other matches had already concluded, it was determined that Ridgeline had already clinched the first-place trophy, Smith said. However, Graf and Beck’s important gold-medal match would determine whether the Lady Thunder would take home a runner-up trophy by tying for second with Park City, or would have to settle for third place overall. In the tension-filled final match, Salem Hills’ Weeks and DeHart jumped out to a first-set win, 6-3. Down 2-3 in the second set, Graf and Beck had their backs against the wall once again, their coach said. 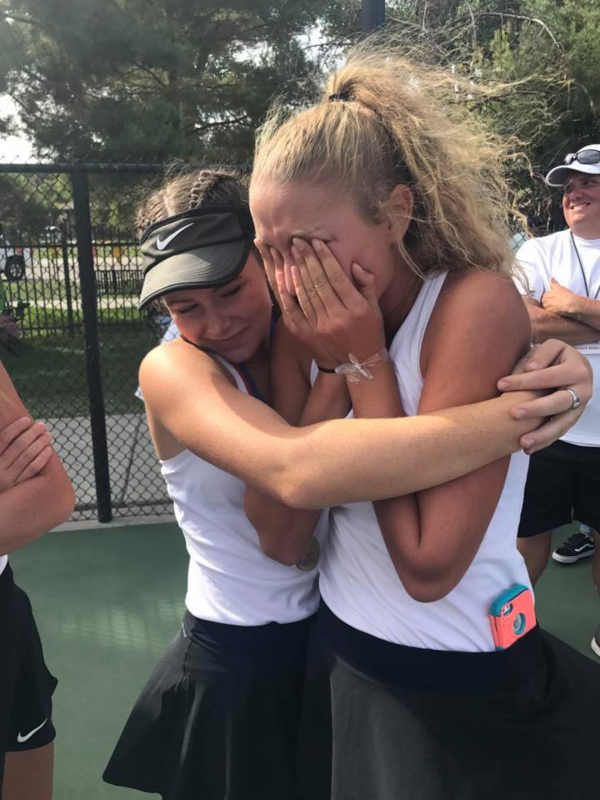 “Yet, just as they had done in their semifinals, they fought back,” Smith added, noting that Graf and Beck won the second set, 6-4, setting up a nail-biting third set to determine if Desert Hills would go home with any hardware. The Thunder then continued the momentum, going up 5-3, but Salem Hills didn’t back down, holding their own serve to move the set to a pivotal 5-4 game, with Graf serving for the match and the runner-up team trophy. After the emotional win, the Desert Hills players mobbed their winning teammates. Smith also had plenty of praise for freshman Beck. I believe we moved from the outside looking in, to one of the prolific teams being watched by the others. Smith said the state 4A runner-up trophy will soon take its place in the school’s trophy case, along with to the other five trophies the Lady Thunder accumulated this season, including their fourth consecutive Region 9 championship, two Stephen Wade Invitational championships, and two other runner-up finishes in other invitational events, both times losing to reigning 6A state champions Lone Peak in the finals, which marked the Thunder’s only team losses during the season.